Let the gypsy dances cast their spell! 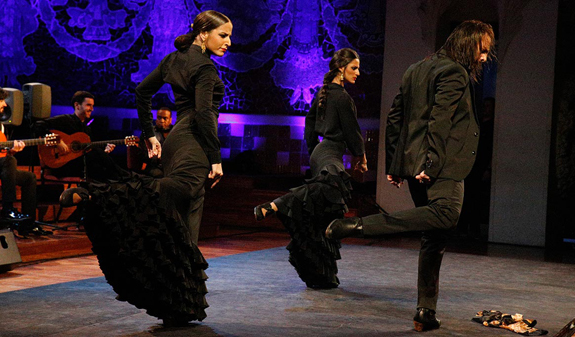 The Fandango, Seguidilla, Alegría, Bulería... Did you know that flamenco has a wide range of rhythms or palos?. 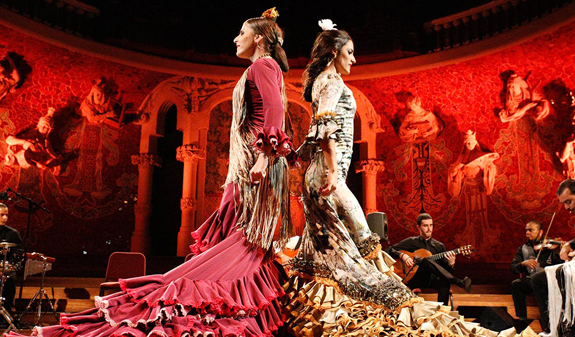 Discover them and enjoy the Gran Gala Flamenco show, the finest performances in this genre you'll find in Barcelona. 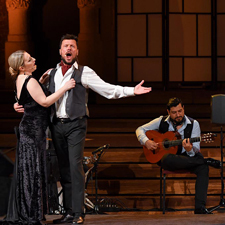 This show reveals the intense passion of the gypsy people through time, and takes the audience on a journey to the different Flamenco strands (from the rhythmic, festive and cheerful “bulería” and the solemn and intense “solea”, to the dynamic and uninhibited “alegría”, the “tango”, “guajira” and “farruca”). 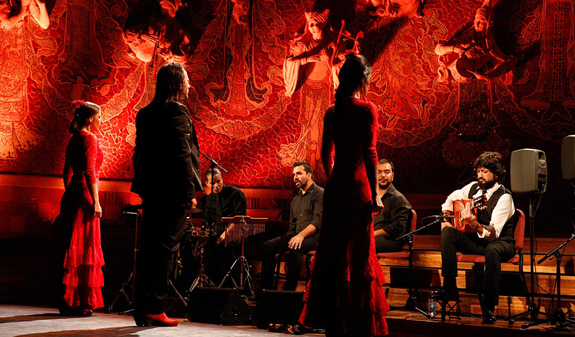 The Gran Gala Flamenco presents the new generation of Catalan flamenco performers and is the perfect combination of heart and spirit, music, dance, passion and rhythm. A unique and unforgettable gift from the heart of Spain. 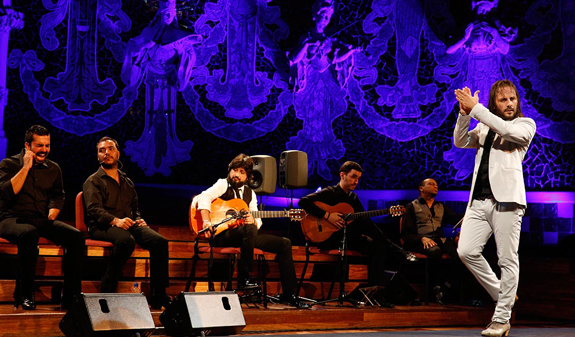 Musicians: Juan Gómez “Chicuelo”, S. Amaya “El Tati” (guitarra), Carlos Caro (violín) and J. Sanchez (percusión) . Bailaores: Vanesa Gálvez “La Lirio”, Maria José González, Nacho Blanco and Iván Alcalá. Cantaores: Raul Leiva Amador and Joaquin “El Duende”. Art Direction: Juan Gómez “Chicuelo”. Palau de la Música: Days 17, 24 and 31; at 9:30pm. Teatre Poliorama: Days 8 and 27; at 7pm. Day 12; at 9:30pm. Palau de la Música: Days 7, 12, 14, 21 and 28; at 9:30pm. Teatre Poliorama: Day 5; at 7pm. Palau de la Música: Days 5, 12 and 26; at 9:30pm. Teatre Poliorama: Days 17 and 31; at 7pm. Day 7 and 21; at 9:30pm. 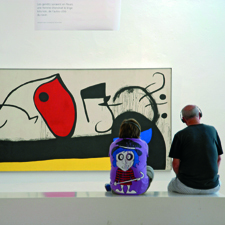 Palau de la Música: Days 2, 16, 21, 23 and 30; at 9:30pm. Teatre Poliorama: Days 6; at 7pm. Palau de la Música: Days 5, 7, 14, 21 and 28; at 9:30pm. 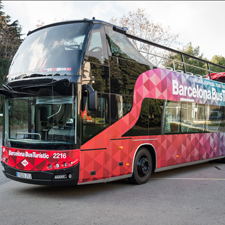 Teatre Poliorama: Days 12, 19 and 26; at 7pm.